Are you procrastinating lately? Or maybe you’re stuck in something you don’t love. Well, it’s time to make a damn choice. 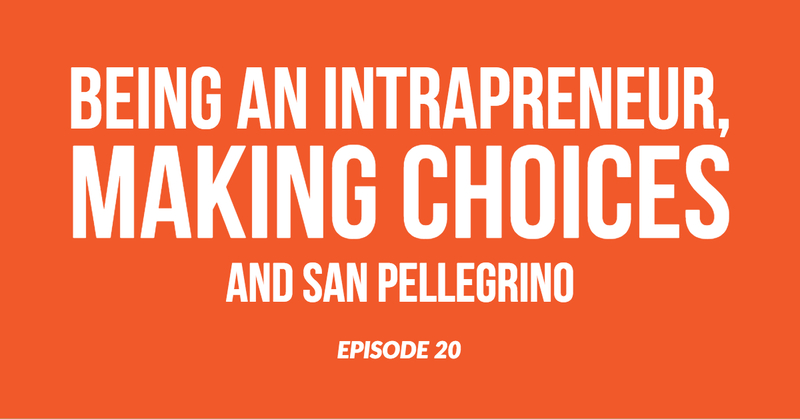 In this week's episode, we talk about what being an intrapreneur looks like. Later in the episode, we discuss the importance of choice. This round is on Marco Noe with the support of Matt Hanham, Justin Bourn, Travis Hayto. The Simple Minds Podcast unravels topics such as personal development, philosophy, life, and business - one drink at a time. Travis is hitting us with the content first this week. We’ve finally moved on from talking about ego. Well sort of. We’re talking about intrapreneurship. The job is the pinnacle. You’ve studied hard for the past 10 years to get that job that’s going to set you up for the rest of your life. There’s an expectation that getting the job you always dreamed of will bring you happiness. You’ll finally be content. But why are people miserable? Why aren’t we happy after achieving what we set out to achieve? Travis suggests it’s because we’re not aligning are career choices with our personal values and beliefs. To be content working for someone else you need to have a passion for the company. Your values and beliefs need to coincide. Which brings us back to intrapreneurship. What is an intrapreneur? According to Travis (and Google) a intrapreneur is a manager within a company who promotes innovative product and development and marketing. Intrapreneurs are often overlooked despite the fact that they’re effecting change throughout the company. You can organise change at any level. Without intrapreneurs who believe in the culture of the company, a change wouldn’t occur. It’s instrumental for growth. You don’t need to create a company to lead one. You can learn to run a business. Justin debates that intrapreneurs shouldn’t be grouped with entrepreneurs. There is a massive difference. Intrapreneurs don’t have to deal with the same pressures. When you work your way up to the top level there is an assumption that the company is stable. There was an opportunity for you to grow. Therefore the anxiety and stresses that come with building the company are lost on the new person in the top position. They come in when it’s established and stable. This isn’t to disempower. Just to state the difference in positions. Travis references two articlesThree Qualities All Great intrapreneurs Have In Common and 4 Essential Traits of Intrapreneurs. There is a lot of overlap qualities with entrepreneurs and intrapreneurs. To be an entrepreneur you need all the qualities of an intrapreneur. However, there are qualities intrapreneurs don’t have. There is so much uncertainty all the time. You never know what’s going on. If you don’t have the mental toughness then you won’t last. Marco shares how he’s struggled with where he fits. Marco went to an elite private boys school, which was competitive by nature. His goal was to get good grades and do the hardest course at uni. He chose engineering and finance. He thought that’s what people wanted to see on his resume. Now as a qualified petroleum engineer, it took Marco 2-3 years of a solid work ethic to realise he was running out of fuel. He started to question where he was, what he was doing. Then it hit him. He was doing things based on what people thought of him. Marco has now identified he’s not an intrapreneur. He’s not passionate about being a petroleum engineer. Instead, Marco is in the space of becoming an entrepreneur by building his own videography brand and business. Finding a place where you can fit and be content with your contribution is key. Whether or not it’s from another company or from building your own. Experiment with your interests and choose the path you want for yourself. Up next with content is Matt, and we’re discussing the importance of choice. If we really think about it we only make a few significant decisions in our lives. Matt asks the group: When do we make these choices vs letting them naturally occur? Often, without even realising it, we are making choices. Even when we don’t make choices. That’s a choice. You make the choice not to make the choice. Matt witnesses people all the time in business who are just lucky to be in the position they’re in. They’re not cut out for it. But they started at the right time. But as times change the fact that they’re not cut out for the job is evident. You start to see lots of little bad things reoccurring. When you take the easy path you’ll find that it creates a bigger problem. You’ll lose your business. Your luck in the market and economics will run out. When you step into a leadership position you need to be 100% truthful with yourself. You can’t ignore problems. They’re still your problems but now you’re 6 months deep and your one little problem is now a big problem and you’re absolutely f*cked. Making the choice not to make a choice is action and decision in itself. But it’s such an unhealthy way to live. Matt asks the group: Why do we not make decisions? What are we afraid of? VISION. If you lack vision then you lack clarity. Your path lacks direction. You have nowhere to go apart from where you’ve been. You can’t make a choice to move forward when you don’t know what forward is. Ask yourself why you’re doing something? What are you working towards? Keep yourself accountable for every choice you do or don’t make. The more we let something fester the worse it becomes. It transfers onto more aspects of your life. It’s like an infection. It spreads and creates negative momentum. That’s the episode. Find what you love to do and make some damn choices about it. Subscribe to the Simple Minds podcast for more reality checks. Are you hesitating about anything lately? Let us know so we can tell you that nothing matters. Do what you want.